First, I wanted to put some PNG images, as did Andy Woodruff and Kirk Goldsberry on the article on Grantland. Unfortunately it looked really ugly on a plot made with R (I bet there is a way, because nothing can be ugly with R, right?). So I decided to create a basketball court first, using ggplot2 (for a change). Let’s have a look at the code. First, we need a function to draw circle because there is no “geom_circle” method (yet?). Hence, we have to be a bit dirty playing with that function. To be able to plot our court using ggplot2, we need to create a data.frame containing coordinates of polygons. We will draw lines between points, for each line of the court. The following function creates a data.frame for one court line, if we provide the four x and y coordinates of the angles of the rectangle representing this line. # in order to use it with ggplot2. There are multiple circles we need to define. Since all lines must be 2 inches wide, I have decided to draw two circles for each one needed on the court. We need to assign the first value of the variable group. Then, each use of new_coords increments group value by one. And now, let’s create the graph! 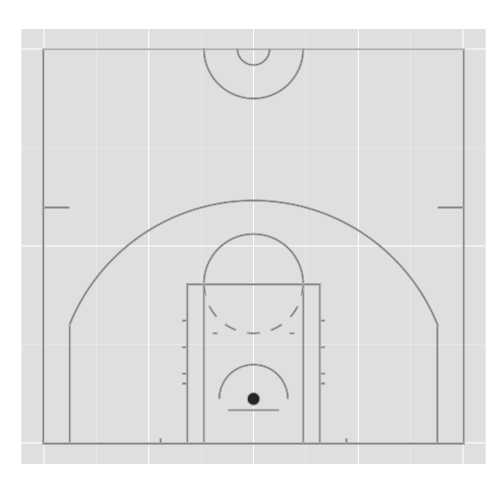 Basketball court with ggplot2 (vertical). Basketball court with ggplot2 (horizontal). To add points, we can create another data.frame with coordinates of the position of the player, and a dummy variable indicating wether the player scored or not. # to your shoots coordinates ! Here is my attempt to recreate Andy Woodruff and Kirk Goldsberry’s animation, but this time, using R only. Also note that it is not that hard to plot the expected possession value on game clock, using “gtable” package. Geotribu wrote a bit more on this topic on their weekly press (in French). You can download the R file to draw either half or the whole court. As requested in the comment section below (thank you AT), you can also download the R file to draw the college court. Basketball whole court with ggplot2. I just had a question that maybe you can help me with. I saw your post on recreating the Goldsberry NBA visuals by creating the court. I’m just wondering if you could provide some help on overlaying a heatmap on top of this image that you create. I have data with x.coord, y.coord, pts (0, 2, or 3). I’m essentially trying to create a « heatmap » of points per attempt but overlayed on top of the court image you have provided the code for. In my ideal world, I’d love to place different sized circles/hexagons to represent frequency, and the shades to represent efficiency, but it seems like this is something hard to do in ggplot from what I’m reading. Any help or tips on what ggplot functions you would use would be much appreciated! If you create a grid based on the court, you can easily estimate densities. You will get a three dimensional table (x,y,z). Then it is not really hard to do what you want, using geom_point function, where you can specify colors according to z, and shape according to the frequency for the (x,y) cell. You might find this post useful to do so: Visualizing densities of spatial processes. Trying to copy your code into R to see if I can recreate this. I get this error that says it cannot find the function “qplot”. Anything you can think of for how I can get your code to work on R? Have you loaded the “ggplot2” library? [code] library("ggplot2")[/code]. Be sure that ggplot2 is installed. If this is not the case, install it running this code: [code] install.packages("ggplot2") [/code]. I have improved the code to draw the whole court, I will upload the R file in a few minutes. Got it to work. 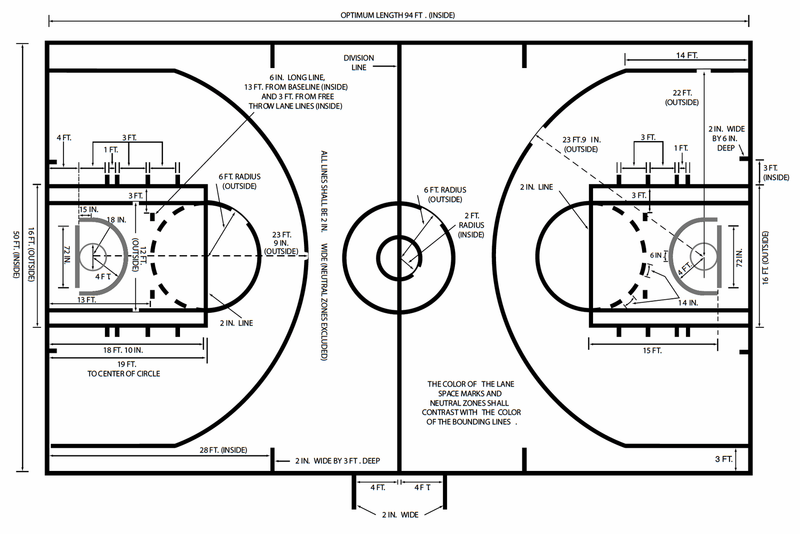 Was wondering if you’d be able to help me draw a college basketball court representation. Please email me if possible.